Aussie astronomers call for more funding in wake of asteroid explosion | Watts Up With That? Astronomers are calling for more funding to watch southern skies, after an asteroid took sky-gazers by surprise and entered the earth’s atmosphere over Africa yesterday. Yesterday morning astronomers in Arizona reported seeing a tiny asteroid, which they described as a new but routine fast-moving object. Before long, scientists at the International Astronomical Union’s Minor Planet Center (MPC) in Massachusetts had calculated the object was likely to pass within one Earth’s radius of the centre of the planet. That means it would have struck the surface of the Earth if had been big enough. Gareth Williams, associate director of the MPC, spoke to AM shortly before the asteroid entered the earth’s atmosphere. “We estimate that it’s about two meters across with a probable range of one to five metres. Something that small will not survive passage through the atmosphere intact,” he predicted. The asteroid was due to come down over Sudan in North Africa, at night, in an area with no observatories and few astronomers. Mr Williams says it will have most likely broken into many small pieces, raining small chunks of rock on the landscape below. “Well those are objects the size of a grain of sand burning up in the atmosphere. Something the size of a football will cause a brilliant fireball. Stargazers in Sudan may have also heard the asteroid collide with the atmosphere, making a wooshing or humming sound. Pingback: Sudan hit by Apollo Asteroid « Watts Up With That? This is a reasonable expenditure of public funds. The science is sound. The probabilities of a strike are small but not zero. Advance warning may allow for mitigation attempts on an asteroid headed to earth. I’m guessing the meteors were generally moving faster than missiles on those small screens in the ’50s and ’60s. Small may have made it tough to decide at first. They need funding. How are they going to get it? May I suggest they quickly release a peer reviewed paper explaining that Climate Change will cause an increase in asteroids hitting the earth! Scientists asking for more funding? Who could imagine? Being a Libertarian I don’t normally advocate more spending by government. But this is one area where we should spend a few billion. While the risk of a large asteroid striking earth in any given year is low, the risk of it happening sometime is very high. We know it has happened many times throughout earth’s history and when it does the results are devastating. But now for the first time, planet earth may have the technology to defend itself from such a disaster. We should develop plans to fend off an earthbound asteroid. In my opinion that would be a constitutional function of government, providing for the common defense. I read somewhere that a pilot (KLM I think) spotted this as it passed by in the distance – I’ll see if I can find a link but it may have been on a pilot forum that I lurk in! We need to invest so much more money in asteroid research in order to avoid disaster. How much is the US currently investing in asteroids? Maybe if we invested much more money, we could get them to behave the way we need them to. Diverting Aussie taxpayer dollars from nebulous “climate change” schemes to something which may actually achieve something beneficial seems like a good idea to me. Ahhh scientists. So calm, collected, cool, detached, and objective. Reminds me of a few months back when there was a slight earthquake in the midwest and the cry was raised that more money needed to be spent on studies of quakes in the region. In these tough economic times funding levels will likely drop in many areas and it’s doubtful that new areas of study will get funding any time soon. It seems that the way the real world works is that there will be little, if any, money for tracking asteroids until there’s a major collision. Then there will be a rush of serious pontificating and throwing of money at research after the fact. Libertarian to libertarian, I agree with your analysis. 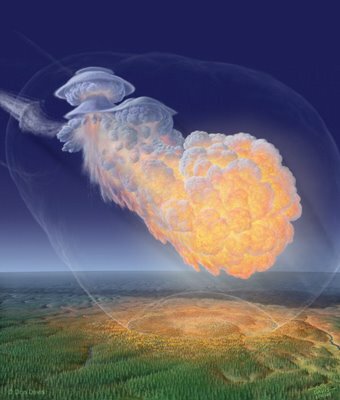 An asteroid impact, no matter how remote, it an external threat and would fall under common defense. We survived Sky Lab. We can do it again. If nature takes us out, then so be it. We’ve all got to die sometime. Hang on … Is CO2 denser than the other elements in the atmosphere? Could pumping more CO2 into the air help create a shield from these asteroids? Nah! It will just absorb the asteroid and re-radiate it at twice the enerygy. Now, let’s see. 1998. El Nino year. All we heard about was El Nino. Everyone thought El Nino was the name of the guy running the planetary thermostat. I probably saw 50 or more detail descriptions of exactly what El Nino (and La Nina) is, and they were all different. As I’ve said before, the average description of El Nino is that the temperature rises as a result of things getting warmer. Now that I think about it, isn’t that the scientific definition? Anyway, I digress. 1998, massive El Nino (not Al Ninno, you’re confusing it with the waiter down at that restaurant on 5th), and two, yes TWO movies about meteoric apocalypse narrowly averted by humanity working together. Okay, one was called Armageddon and had Bruce Willis and Liv Tyler. It was all about action and big screen fakery and feel good and the big finish where everyone lives happily ever after (except Bruce Willis’s character). The other was called Deep Impact and had Robert Duvall and Morgan Freeman and was more about how it would probably work out. Dirty, awkward, inaccurate, and in the end, tragic… but not as tragic as it might have been. Now, let’s face it, 1998 was the warmest year since 1934, or vice versa, or it all depends on who you let handle the records because the actual warmest year might very well have predated the invention of the thermometer, we’ll never really know. But you get where I’m going with this… 1998, warm year, two meteor impact movies. My personal theory is that the warmer the planet is, the more meteor impact movies get made. The only way to stop this travesty is to send so much funding to me, CodeTech, that nobody can afford to make meteor impact movies during warm years. Yeah. Do that, and you’ll all be allowed to visit my houses when I’m not in them. I once saw a meteor come through the clouds on a foggy, rainy night. It was as if somebody had thrown a lit blue green white street light from the sky (maybe Thor?) It lit the clouds and rain around it then disappeared from my view. I thought there was a near earth asteroid watch program already. Is he suggesting we need to expend funds to watch for asteroids that will have a negligible effect on the the earth? No one (in any forum) seems to have noticed that if you develop the technology to deflect a dangerous asteroid away from earth intercept (a very unlikely event, occuring maybe once every 100 million years), then you have also developed the technology to deflect a non-dangerous asteroid INTO earth intercept, an outcome dependant only on the ability of an unstable group to get their hands on such technology. The danger is infinitely small – it has been with us since the birth of our species, and we only worry now because for the first time we can measure it. The “cure” for our worries could easily – probably – be the path that leads to destruction. So to be clear – not one cent for asteroid deflection research, since it will be instantly weaponized. Ideologs obsessed with weaponizing have for years cried stridently against developing any asteroid deflection technology because it ‘could’ be weaponized. It is utter folly for mankind to leave itself defenseless against an inevitable asteroid strike because the chicken littles can imagine a pathalogicla scenerio. Asteroids with impacts of tens of megatons strike far more frequently than 100 million years. Try a thousand years more or less. Mankind spends just a few million dollars a year (not a typo) looking for Near Earth Objects (NEOs). It would be prudent to spend the modest sum of several tens of millions annually to detect and monitor all such NEOs 50 meters and larger. Once that is done, we could carefully consider the choices for the more expensive task of the correct interception strategies. A mission or two to NEOs to determine their composition and tensile strengths would provide good scientific and engineering baseline data. Facts are always helpful. What if we see an asteroid coming? Are we going to allow the group that brings us GISS, forgets to convert feet to meters (Mars lander), and can’t maintain a manned spaceflight program to try to push it out of the way? With that kind of talent, they would likely make an asteroid that would have missed earth, actually hit it. Thanks, I’ll take my chances. More funding for the Chicken Littles!!!! Drain the Treasury in the name of Dire Reports!!!!! Head for the hills, or hide under your bed, but first give me all your money!!!!!!!!! Ladies and Gentlemen, we are privileged to witness the decline and fall of civilization worldwide. It’s happening now. The entire system of human social cohesion is falling apart as megathieves loot the peasants in every country on Earth. That’s the Big Dire Report. Not AGW, not asteroids, not bin Laden but total social/economic collapse. Happening now. WWS your point about weaponizing asteroids is possible. As I recall there was a 50s Sci Fi movie about such a scenario. Crappy movie but the asteroid weapon idea is possible. But I think the risk of terrorists doing that is extremely remote at present. The technology to do it is beyond their means right now. In the future though that technology will become more and more available, just like any other weapon. That will happen whether we do it or not. Somebody will do it. We should develop the technology so that we can deflect asteroids that are intentionally aimed at us as well as those that are naturally occurring. The dinosaurs would not be extinct if they had a space program. We’ve already shot down a sat with are missile defense system. The ability is there. We may try sometime in the future to hit one just to see if we can do it. You never know. If there was enough time from detecting it to reworking the software like they did for the sat shoot down, they might give it a whirl on a smaller one that wouldn’t cause us harm if we missed or broke it up. Some practice just in case we need to really do something about a bigger one. Size and composition obviously come into play here, and whether or not it would be the best solution. But just knowing we could do it adds the option. ground control to Major Tom – maybe the Dinosaurs DID have a space program, ever think of that? The dinosaurs did have the technology. They got it from the people that built the pyramids. After the last 2 weeks of economic metldowns, I wouldn’t be surprised to see a few radio telescopes on eBay. Scottish non-astronomers are calling for more funding into why Australian austronomers painted a picture of Daffy Duck, wearing a cape, flying a broomstick. fascinating to be in the right spot and watch an event like that. Meteosat 8 captured the impact!! I was thinking more along the lines of Mary Poppins. Haggis shortages, bust banks, floods and now being attacked from space by Daffy Duck, wearing a cape, flying a broomstick. Wha’s like us? I think that covers the first page of WUWT anyway.